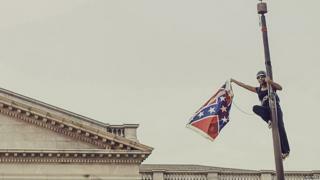 On Saturday morning Bree Newsome climbed up a flagpole on the South Carolina state house grounds an activist, determined to take down the confederate flag flying there. By the time she climbed down and was quickly arrested by state police, she was a hero to many online. The act of civil disobedience by Newsome and spotter James Ian Tyson sparked an outpouring of support on social media sites. The hashtags #freebree, #freejames, #takeitdown and #keepitdown started trending on Twitter as soon as Newsome started descending the 30-foot pole, grasping the Confederate flag in her hand. One man tweeted: "@BreeNewsome, you fearlessly took down the confederate flag in South Carolina today. We stand with you. #FreeBree"
Newsome and Tyson were arrested and charged with "defacing a monument," an offense that is punishable by a maximum of three years in jail and $5,000 (£3,173) fine. Supporters quickly started petition to free the activists and convince authorities to drop the charges. About 4,000 people donated to an Indiegogo campaign "Bail for Bree Newsome" which raised more than $112,000 since Saturday. But, more than admiration, Newsome began to take on a larger-than-life significance for those online who wanted to - sometimes literally - sing her praises. "Just got off a plane and saw that #BreeNewsome has turned SC into the final scene of a blaxploitation movie. Roll credits. Play theme," tweeted the New Yorker's Jelani Cobb. "Speaking of which, somebody should composing theme music for #BreeNewsome - preferably something that starts with cymbals." Some supporters tweeted at Time, suggesting that the pictures of Newsome taking down the flag should be the publication's photo of the year. Meanwhile, the director Ava Duverny wrote that she hoped to "get the call to direct the motion picture about a black superhero I admire. Her name is @BreeNewsome." Not everyone saw Newsome and Tyson in the same light, however. On a Facebook group named FreeBree, Facebook user James Jolly commented: "Not courage. Lack of respect". Jeff Wood said: "Don't touch our flags." On Monday Newsome released a statement to the left-leaning website Blue Nation Review saying the flag symbolised past and present discrimination against black people worldwide, and that removing it was part of her larger quest for social justice. "I did it for all the fierce black women on the front lines of the movement and for all the little black girls who are watching us," she wrote. "I did it because I am free." Next story: Who came out against Facebook's rainbow flags?